Voxco Online is a cloud-based online survey software used by professionals and researchers from the academe, government agencies, market research firms; and other organizations, industries, and businesses. 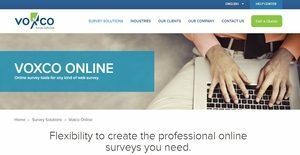 Described as a flexible and feature-rich online survey creation and distribution platform, Voxco Online enables users to create any type of web surveys and customize them using its questionnaire design toolbox. This allows them to add video and audio files and images to their surveys. Users will also be able to invite respondents through social media (Facebook and Twitter), email, and SMS text to answer and complete their surveys. In addition, Voxco Online aids users to determine how their respondents are answering their web survey, whether they are filling out all the information and answering all the questions in it or abandoning the survey at some questions. It also offers a panel management feature which helps users recruit and maintain a community of survey takers or panelists, helping them maximize their response rates. Voxco Online can detect the devices used by respondents in completing their surveys. With such capability, users will be able to learn which devices (tablets, desktops, or mobile phone) their respondents prefer to use when completing certain types of surveys. The survey data reporting functionalities of Voxco Online are among its outstanding features. Survey results are automatically made available for users, in order for them to evaluate how respondents are participating in answering their survey. Hence, users will be able to identify how many questionnaires are completed and how many are submitted with incomplete information. Data on the number of respondents that are screened out are also included in survey reports. These are the people whose demographic information or answers don’t fit the requirements or criteria of a particular survey. Moreover, the survey software provides data on the number of respondents that are not able to complete the survey; because they run out of time while answering the survey. Voxco Online offers another functionality that allows users to automatically send reminders to the people they invited to answer their surveys. These reminders can be sent through email or text message, and users can schedule when they will be sent out. Furthermore, they can track if the people whom they sent out their email or text reminders to are responding or not. This is known as response rate. The online survey solution also helps users customize their surveys to promote their brand identity and make their respondents feel comfortable answering them. Through its questionnaire design toolbox, users can add video clips and audio recordings to their surveys. The respondents themselves can include pictures, videos, or recordings to their answers. Users can also customize their surveys with different buttons, as well as, change their colors and fonts. If you are interested in Voxco Online it might also be sensible to analyze other subcategories of Best Survey Software listed in our base of B2B software reviews. Since each company has specific business requirements, it is prudent for them to refrain from seeking a one-size-fits-all perfect software solution. Needless to say, it would be useless to try to find such a platform even among market-leading software applications. The clever thing to do would be to catalog the various important elements that require consideration such as required features, budget, skill levels of employees, company size etc. Then, you should do your research thoroughly. Read some Voxco Online reviews and investigate each of the other systems in your shortlist in detail. Such comprehensive homework can make certain you reject ill-fitting systems and zero in on the app that provides all the elements you require for business success. How Much Does Voxco Online Cost? Voxco Online’s SMB and enterprise pricing information is available only upon request. Contact the company for more details, and ask for your quote. We realize that when you make a decision to buy Survey Software it’s important not only to see how experts evaluate it in their reviews, but also to find out if the real people and companies that buy it are actually satisfied with the product. That’s why we’ve created our behavior-based Customer Satisfaction Algorithm™ that gathers customer reviews, comments and Voxco Online reviews across a wide range of social media sites. The data is then presented in an easy to digest form showing how many people had positive and negative experience with Voxco Online. With that information at hand you should be equipped to make an informed buying decision that you won’t regret. What are Voxco Online pricing details? What integrations are available for Voxco Online? Voxco Online supports integrations with social media platforms like Facebook and Twitter. If you need more information about Voxco Online or you simply have a question let us know what you need and we’ll forward your request directly to the vendor.